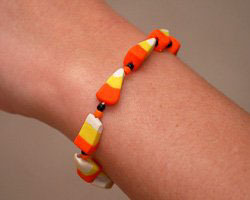 This candy corn bracelet is made from a polymer clay cane. 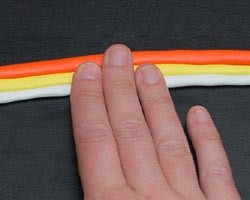 It is very simple to make, even if you don't know the first thing about polymer clay! 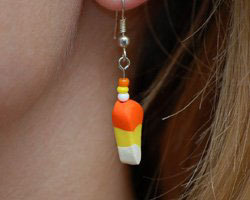 This complete project tutorial will show you, step by step, how to create the candy corn beads. The beads can then be threaded on to elastic cord to make a bracelet. You can also use the beads to make a necklace or earrings. This Halloween jewelry looks great, and children especially love them! 1. 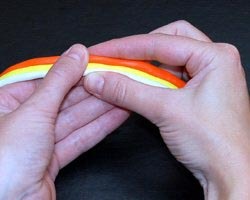 If you have never worked with polymer clay before, consider reading my Working with Polymer Clay article before you begin. It is full of helpful hints for the beginner. 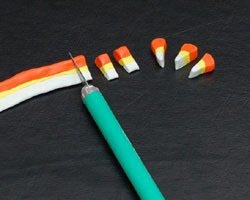 Begin the candy corn bracelet by conditioning the clay well. 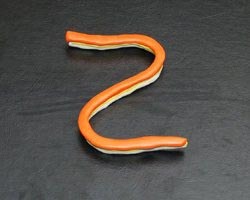 Then, roll the clay into three snakes of varying sizes. 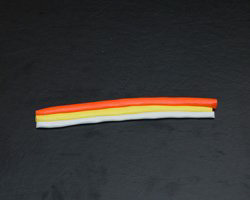 Make the orange snake the largest, the yellow snake the next largest, and the white snack the smallest. There is no exact sizing here. 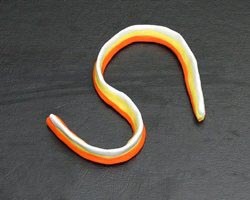 You can make the snakes skinnier later if you wish (which will result in smaller beads). 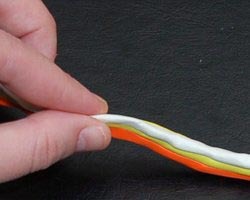 The longer the clay snakes are, the more beads you can make. The size I made created enough beads for six bracelets! 2. Next, place the rolls right next to one another on a flat surface. Begin with orange, then yellow, then white. Squeeze the rolls together slightly. 3. While the clay is still on your flat work surface, start pushing down on the clay rolls to flatten them slightly. Do this with the pads of your fingers or the palms of your hands. As you do this, put more pressure on the white clay to flatten it more, and do not apply as much pressure to the orange clay. 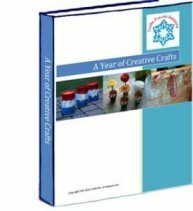 In this way, you are beginning to create a triangle shaped polymer clay cane. Turn in over and do the same to the other side. 4. 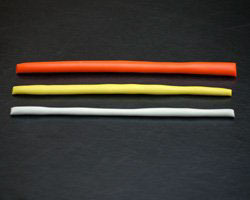 Now pick up your polymer clay cane. Beginning at one end of the snake, grasp the clay between both fingers and apply pressure to create a triangle (the white is the tip). Move all along the cane doing this. Try to keep the cane a uniform size. 5. 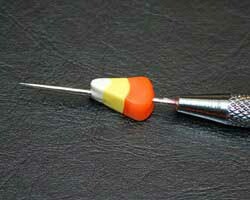 Here are a few photos of what your candy corn polymer clay cane should look like. It will come to a point at the top, and be wide at the bottom. 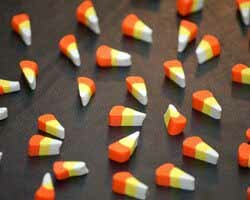 A cross section of this will look like a triangular candy corn! 7. Using a blade, cut off slices of clay that are about 1/4 inch thick. 8. Using a thick beading needle, pierce each bead lengthwise to create a hole that runs all the way through it. Twist the needle as you gently push it in, so you don't change the shape of the clay. Make sure you make the hole nice and wide. You don't want to bake them and find out the hole is too small. 9. Next, bake the clay in the oven according to the manufacturer's instructions. Allow them to cool completely. 10. For the candy corn bracelet: Thread each beads on to a length of stretchable elastic cording. You can also thread seed beads in between. 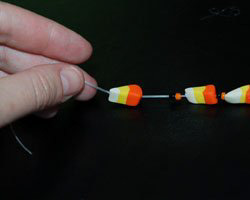 When the candy corn bracelet is large enough, tie off the elastic cording with several square knots. Cut the hanging ends of the elastic off, but not too close to the knot. Then, apply a drop of very strong glue to the knot. I have used super glue in the past. When it is dry, you can cut any excess elastic a bit closer to the knot. 11. 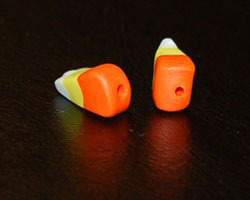 For the earrings, thread any seed beads on to an eye pin, and then add a candy corn bead. Secure the end of the eye pin by bending the end of it up with jewelry pliers, so the beads cannot fall off. Then add on french hook earring findings.